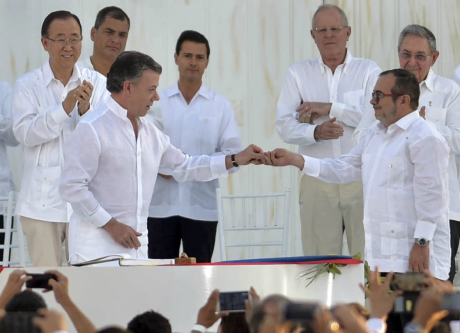 Colombian President Juan Santos hands the pen to FARC commander Rodrigo London, as world leaders look on. Photo: PA Images. All rights reserved.This article has been published as part of the partnership between ¡PACIFISTA! and democraciaAbierta. You can read the original article here. Recently, a meeting took place between the Colombian government and the ex-guerrilla group FARC, led byPresident Juan Manuel Santos and Timochenko respectively. They met to assess the progress made in the implementation of the agreement they signed that allowed for the FARC’s demobilisation and voluntary laying down of arms. It was noted that there was no photo taken of the two heads of the parties, which seems to be the beginning of a new phase in which the government will focus more on the advantages that the agreement has for its citizens through its public communications, rather than the benefits the FARC are receiving for their voluntary disarmament. The details of this meeting are little known, but it seems to have been carried out in a friendly atmosphere. The reason for such a cordial exchange is likely a result of both parties having complied with the toughest aspects of the agreement: the guerrillas have demobilised, and are currently in the process of disarmament, whilst the government have secured the ratification of the agreement with a majority in Congress and endorsement from the Constitutional Court; approved the agreed amnesty; set out the required security conditions, and approved and adopted the necessary measures that will allow the reintegration of FARC members into society. The meeting will certainly have been witness to some minor complaints: the transitional zones, where FARC members will begin their reincorporation into civilian life, are not entirely adequate, and the FARC have not accelerated the demobilisation of ‘recruited minors’. Some comment that these issues are far from significant enough to derail progress made to date. But the biggest complaint will come from outside of the agreement, where the majority of Colombian citizens maintain their disapproval of the concessions that were made to the FARC guerrillas in the deal, in exchange for their demobilisation and disarmament. And the public have not seen any great benefits from the trade-off yet, despite the fact that in the areas that have been most affected by the conflict, there is a marked decrease in fear and violence. Aside from this challenging context surround the agreement, President Santos has concentrated on ensuring that the agreement, as far as the FARC is concerned, is fulfilled. That is why he has personally visited the zones previously controlled by the ex-guerrilla group, and why his government, led by the Minister for the Interior, has put all its efforts towards securing the required majorities in Congress to guarantee the agreed process of reincorporation and ensure the legal stability of the agreement. None of this generates more citizen support, however. Those who opposed the agreement on 2 October 2016 – when the ‘no’ vote won the referendum with a slight majority – still hold the same position, and the state’s resolute commitment to the agreement following the result only qualifies their feeling that the state has given in to the FARC. This is why action, and communication, regarding the implementation of the parts of the agreement that represent improved material well-being for ordinary people is urgently needed, more than simply offering the termination of the conflict as their chief gain. This single aspect of the agreement represents little value to citizens, even where it has brought a real change in living conditions. The government has already announced that it will promote and fast track a constitutional amendment that will allocate part of the mining and oil rents to finance the implementation of ‘Point 1’ of the agreement: rural development. This involves investment in roads and other territorial development plans in at least 170 municipalities, and will cost more than 15 billion pesos ($5.2bn), of which 1.5bn pesos are already set aside. Where the battle for public opinion was lost in the referendum, the same mistakes have been made in the first phase of implementation. There is no widespread belief that the FARC’s demobilisation has brought improved security conditions. It has allowed criminal gangs – copying the FARC – to emerge in areas previously controlled by the guerrilla group, replacing an army of more than 7,000 combatants that had been built over decades with ease, and continuing where they left off. Without more empirical evidence in the media, the words of the agreement’s opposition are continuously repeated: the deal hasn’t brought peace of mind in previously FARC controlled territories, and that the guerrilla group is still involved in criminal activity and the drug trade, as claimed by the governor of Antioch without any proof. The government has been on the defensive in the field of anti-drug policy, in the face of evidence that illicit crop cultivation significantly rose during the peace negotiation phase. And it has failed to show any significant results of having demobilised the activity of a group that acted as the largest logistics coordinator for the processing of coca leaves before their delivery to narco-traffickers. The care taken over the recent meeting between the government and the FARC, and the calculated decision to avoid photo-opportunities between President Santos and Timochenko is a sign that the two parties are beginning to understand the atmosphere of public opinion better. It also suggests that the communication of benefits for the citizens who live the areas that not so long ago were a war zone, rather than those issued to the FARC, will become the focus in the immediate future. Hopefully, the media and organisations that have supported the process will also shift their focus from the FARC, to the benefits that the agreement has brought to peasant farmers, indigenous communities and ordinary citizens. For it wasn’t long ago that children wouldn’t go to school for fear of being caught in cross-fire, and ultimately, it is the progress in these areas of society that need a similar media attention to that which has, to date, been afforded to the FARC’s gains.